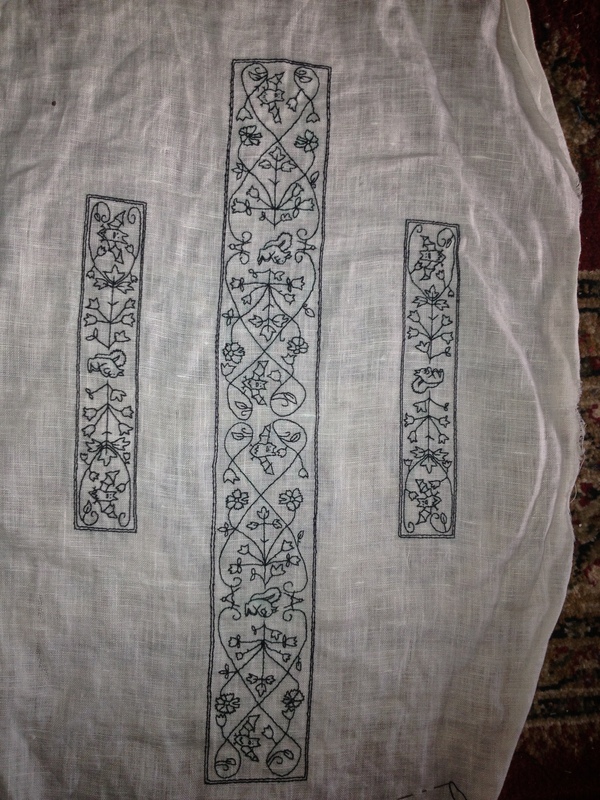 For the reign of Felix I and Eva I, I was asked by the Mistress of Wardrobe, Lady Ursula Von Memmingen, to embroider a blackwork collar and cuffs. The embroidery was for a shirt to be worn under a 16th century Saxon outfit by Queen Eva for her divestiture on 6-7 June 2013 in Mordenvale. I was delegated the task of designing a pattern for the collar and cuffs and completing the embroidery prior to her divestiture at Midwinter. bats (a personal favourite of Her Majesty). There happened to be a Kingdom A&S competition on blackwork cuffs held at the Midwinter event, and so I wrote this project up to enter. I ended up placing first in the competition, which was very exciting! And, Eva was happy with the pieces. So, all in all a successful project. The full documentation I entered can be downloaded here: Blackwork Collar and Cuffs for Queen Eva I. The documentation outlines a brief history of blackwork, and how it is relevant to 16th century Saxon garb (which was the style of Queen Eva’s divestiture garb). I also link what I did to period examples. There are also links to pattern/model books for those interested in looking at 16th century embroidery (particularly German) patterns. They say that pictures speak a thousand words… so, here are some pictures! The pattern I created for the collar, based on 6 design elements (outlined in the full documentation). This is one of two repeats of the pattern. The full cuff pattern, derived from simplifying the collar pattern. A close up of some elements of the cuff. 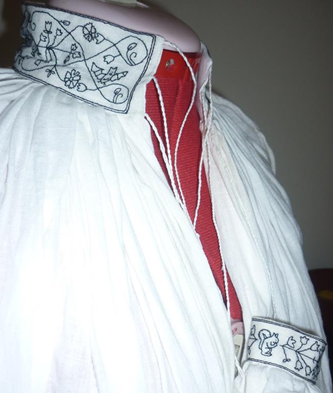 The completed collar and cuffs. The collar and cuffs were attached to a shirt that Lady Ursula made for Eva. 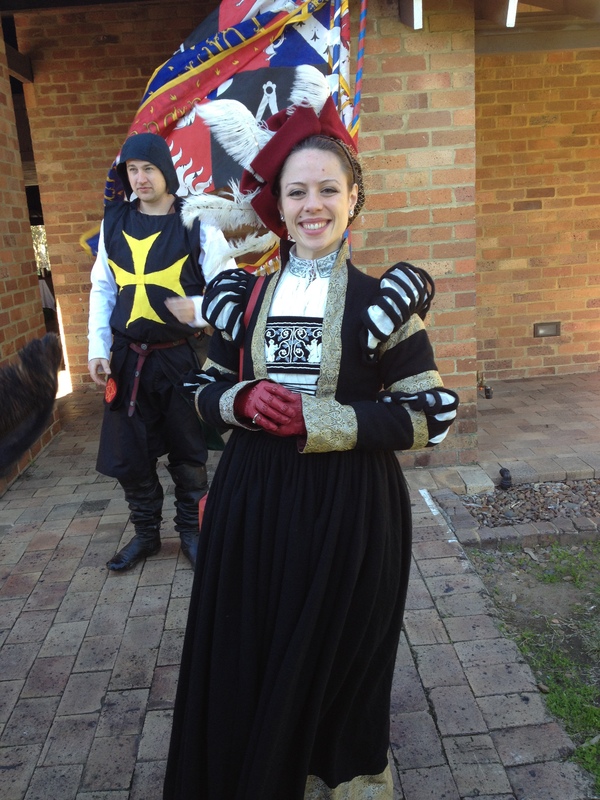 This was a wonderful entry Lady Ceara. I’ve kept back a copy of your documentation as a great example of good documentation, & to pass on to KMA&S. This is amazing! I’ve just decided to look into a late period persona and thus, turn my embroidery skill towards the land of blackwork. I’m happy to see such a great example of taking a historical approach, yet also incorporating individual likes and preferences. Thank you for your comment – that’s nice of you to say. Hedgehogs and flamingos sound fun!